The pine cone is shown in many different works of art in ancient Mesopotamia, Egypt and area. In the depictions of Nisroch, he is shown holding up the pine cone sprinkling the sacred tree with water; as he is the Assyrian god of agriculture, and he would be prayed to for a good crop yelid. 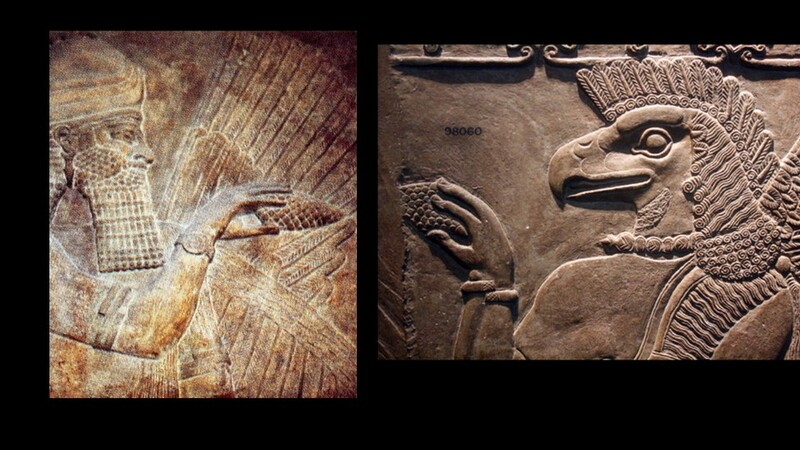 The pine cone is also held up by other winged dieties and non deities as shown in the picture on the left. The pine cone represents ‘new life’ or regeneration, as they are where a tree would begin its life. It was used to sprinkle water for plants, as well as for blessings, or blood. These pictures are supporting images for Nisroch.